By Adrianne Pasquarelli . Published on November 26, 2018. Amid all the Cyber Monday sales noise, some direct-to-consumer brands are pursuing a different strategy from their older retail peers—and it doesn't include a discount. Brands like Allbirds, the sneaker seller, and eyewear company Warby Parker are taking advantage of consumers' shopping state of mind to promote limited-edition collections. Others, like Away, the luggage purveyor, are promoting their already-low prices. 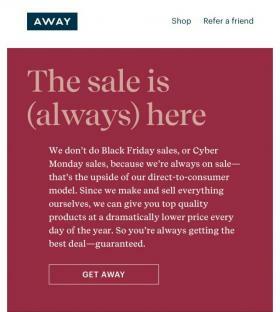 "We don't do Black Friday sales, or Cyber Monday sales, because we're always on sale—that's the upside of our direct-to-consumer model," read an email from 3-year-old Away to consumers on Monday morning, noting that the brand's model of manufacturing produces a "dramatically lower price every day of the year." Allbirds, which has been growing with new stores and products, dropped a new shoe color on Monday with a variety of different colored laces and soles. "Allbirds doesn't offer discounts as they have already committed to providing customers with the highest quality product for the best possible price," a spokeswoman says. Warby Parker tweeted on Monday about its holiday frames, with no mention of a deal. Similarly, San Francisco-based apparel and accessory brand Everlane used the shopping holiday to promote its charity efforts. Such messages are in sharp contrast to retailers such as Gap, J. Crew and Crate and Barrel, which bombarded consumers' inboxes on Monday with promises of deep discounts and unbeatable sales. For instance, Gap promised 50 percent off, while Zales promoted discounts between 30 percent and 50 percent. While not offering discounts may seem counter intuitive for DTC retailers, it could help maintain brand strength in the long run by not training consumers to expect sales. "It doesn't make sense to discount core products because it dilutes the brand," says Sucharita Mulpuru, VP, principal analyst of ebusiness and channel strategy professionals at Forrester Research. She notes that it's possible such brands may not need the order volume associated with big discount days, which can hurt margins. "[Such brands] are small, so they can keep growing organically," she says. DTC brands are resisting deals at a time when their target millennial shoppers are willing to open up their wallets. According to payment company Splitit, 43 percent of millennials planned to spend on Cyber Monday this year, compared with 39 percent who preferred to shop on Black Friday. 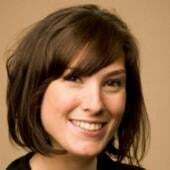 "Consumers are looking for more choice," says Lynsey Thornton, VP of core product at Shopify, which provides selling platforms for retailers. She says smaller, direct-to-consumer brands have the advantage over big-box competitors of offering "greater personalization, customer care, and trust in the quality of the goods they're selling." Cyber Monday is on track to be the biggest online buying day in U.S. history, according to Adobe Analytics, which predicts year-over-year growth of 18.3 percent to $7.8 billion. As of 10 a.m. ET, Cyber Monday sales reached $531 million, Adobe says—and that was pre-lunchtime rush. Thanksgiving and Black Friday in-store traffic declined 1 percent year-over year, according to a CNBC report citing ShopperTrak data. Even so, many retailers, including J. Crew, suffered the usual glitches on Monday, to consumer frustration.